Windows-loving Master Chief wannabes rejoice: Microsoft is finally bringing a Halo game to Windows 8 and Windows Phone 8. It's called Halo: Spartan Assault, and it trades the familiar first-person view of the hit Xbox series for a top-down perspective. The game launches in July for $6.99. On phones and tablets, the new Halo will use touch controls, with the left thumb controlling movement and the right thumb controlling directional fire. The PC version will also support mouse and keyboard controls, with Xbox 360 controller support coming after launch, according to Engadget. As usual, players control a Spartan super soldier while blasting away at the alien Covenant. 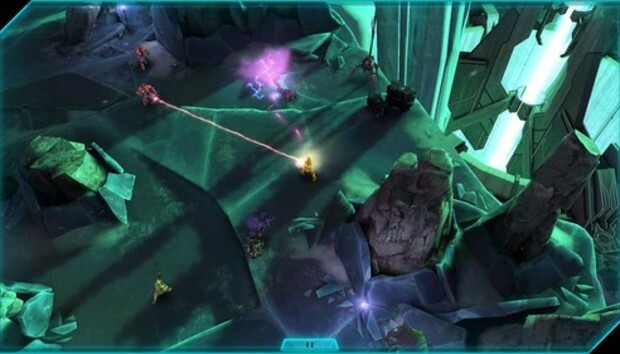 Although the perspective has changed, glimpses of action in the official trailer show a familiar mix of dual-wielding machine guns, purple-glowing alien weapons, vehicles such as Ghosts and Warthogs and plenty of cover to hide behind. The story will be set between the events of Halo 3 and Halo 4, and will reveal more of the backstory about the war between humans and the Covenant. Microsoft promises 25 single player missions, but unlike every other Halo game to date, Spartan Assault will not offer multiplayer. Still, Microsoft is trying to tap into Halo's addictive properties by letting players earn achievements, experience points and unique emblems in Halo 4 by playing the mobile game. Players will also be able to compete in online leaderboards and participate in weekly challenges. Microsoft has also added some of the trappings of modern mobile gaming: Cross-platform play is supported, so players can start a game on their tablets and continue where they left off on their phones. And for better or worse, Halo: Spartan Assault will offer microtranscations, so players can avoid grinding through the game by purchasing credits for boosts, unique weapons and armor abilities. It's about time Microsoft brought the Halo series to its phone and tablet platforms. The game has long been a system-seller for the Xbox and Xbox 360, but it's been conspicuously absent from Xbox Live on Windows 8 and Windows Phone 8. And although some gamers may gripe about the lack of iOS or Android versions, Halo has always been exclusive to Microsoft's platforms, and there's no reason for that to change. Hopefully this isn't a one-off thing, but the start of a more serious push by Microsoft to bring versions of hit Xbox games to Windows phones and tablets.